Check the calendar for member-led swim details and to RSVP. 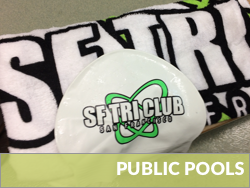 Many club members swim at public pools for a low drop-in fee or with a Masters class that is conveniently-located for them. New for 2019! The Club has initiated a swim challenge! Complete any 4 of the 5 challenge workouts and receive a prize. Sign up here. Questions? Feel free to email the swim officers. Club sponsored swim clinics are offered during the training season. Clinics vary from one time open water clinics to swim series in a public pool. Each fall, the club hosts its very own private escape from Alcatraz swim for a fraction of the cost of other escorted Alcatraz swims. You'll be paired with your club mates of similar speed and escorted by a kayaker. 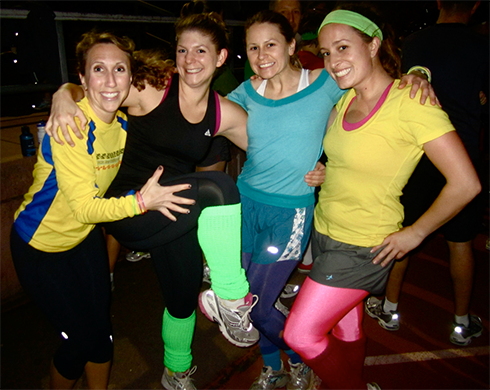 This is a super fun club perk, not to be missed! Garfield Pool: 26th and Harrison Streets in the Mission District. Martin Luther King Jr. Pool: 3rd Avenue and Carroll St. in the Bayview-Hunter's Point District. Rossi Pool: Arguello Blvd. and Anza St. in the Richmond District. Sava Pool: 19th Avenue and Wawona St. in the Sunset District. Hamilton Pool: Geary and Steiner in the Fillmore District. Balboa Pool: San Jose Ave & Havelock, southeast of Twin Peaks. 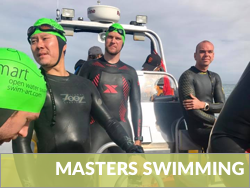 Pacific Masters: Central organization for over 100 masters swimming clubs in Northern California and Nevada. Must have a membership through them to be a part of a masters club/team. Comprehensive list of clubs can be found here. USF Masters: Located in the Koret Center at USF. Contact coach Valeriy (415) 422-2597 or Cathy Huang 415-422-6247. $15 drop-in fee. Call first. Must have masters card. Fog City Masters: Located at Herbst Natatorium at St. Ignatius High School in the Sunset. $6.00 drop in fee, masters card required. Contact Diane Davis at 415-682-5044. SF Tsunami Masters: Located at Hamilton pool. Must have a masters card, first two swims are free then must join club to continue. info@sftsunami.org. UCSF Masters: Located at UCSF Bakar Fitness Center in Mission Bay. Must be a UCSF Fitness Center member. Must have Masters Card. Nominal additional monthly fee for unlimited masters practices. South End Rowing Club: The cities oldest swimming and rowing club. More details. Dolphin Club: Row and swim in the bay. More details. 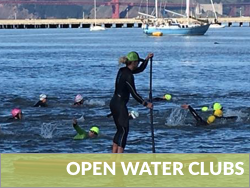 Swimart: Offers year-round open water swimming programs in the San Francisco Bay, including group swims, clinics, and special expedition swims.More details. Water World Swim: Coach Pedro (swam from Alcatraz over 500) hosts group swims in Aquatic Park. This group is very focused on Alcatraz crossings and hosts many open water swim races. More details.